For August 28, 2010, it was another bad weather forecast. This time we chose Zowie for its short approach (1.5 hours) and short climb (6 short pitches) that, combined, would allow us to beat the 40% chance of rain after noon. The only problem with Zowie was the 5.8+ finish on the easiest route to the summit. There was a time when that was no problem; but, we haven’t climbed anything harder than 5.7 in a long time. Brian remembered that we could bail from the bottom of the crux pitch, so we decided to go for it. We started hiking at 4:45am on a clear night from a nearly empty parking lot. The trail went faster than the week before, and so the sun didn’t come up until just before we left the trees. Heading toward Zowie, we left the trail soon after leaving the trees; we turned left to cross the Andrews Glacier drainage creek, and then hiked uphill to the base of the climb. I’d done Zowie at least three times before. 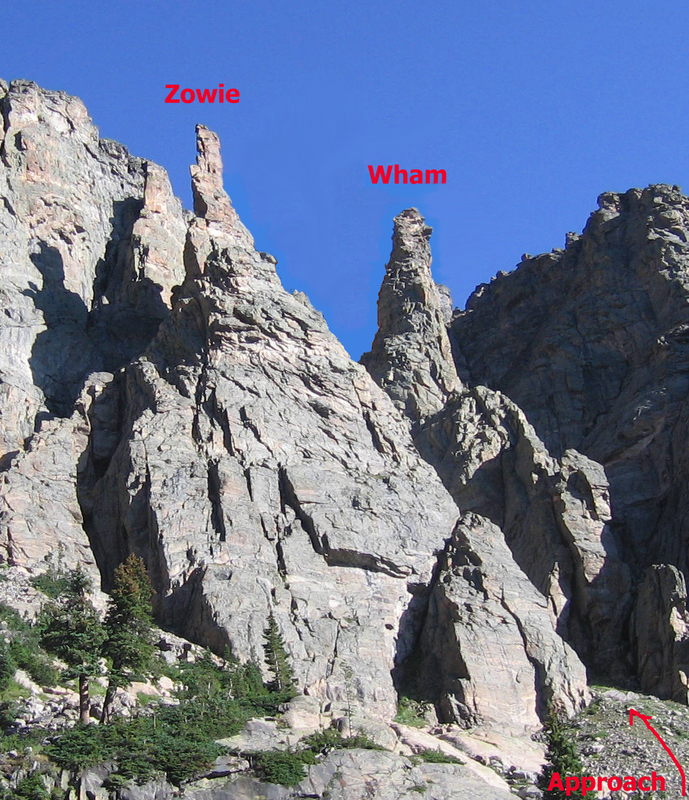 The first climb of Zowie (7.27.1997) was up the left side of the South Face with a true south face finish. I don’t know the route name; I just climbed where Mark indicated. The second climb of Zowie (9.21.2001) was the standard South Face route (that ends on the East face), or, at least Brian and I thought so at the time. The third climb was in August 2003 when Brian and I redid the standard South Face route except for a variation on the last pitch where we traversed back to the south face to climb to the summit. This time we’d repeat the standard South Face route although, this time we’d find a better path, that stayed on the south face until the final pitch. We stopped at the base of the climb to eat a bit of breakfast. Oddly, neither of us could remember the actual start to the climb. The topo didn’t seem to match the rock; but since we could see the big chimney that we had to climb to reach the big ledge, it didn’t matter. I took the first pitch so that Brian would lead the crux pitch. 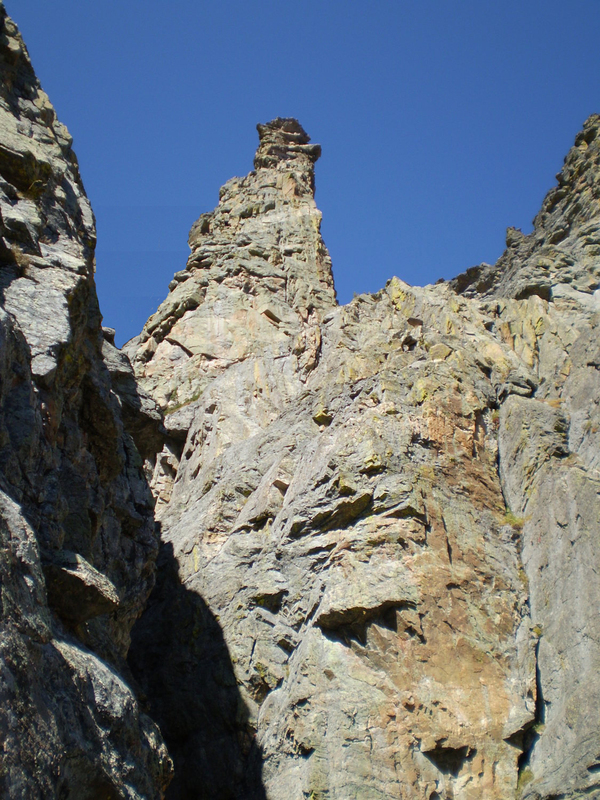 I traversed along a seam in the rock to get below the big chimney, and then belayed on a nice ledge below the “V”. It was rated 5.5 but felt harder in a few spots; I supposed I just wasn’t climbing well. Brian then ran the rope up the chimney. We took the lefthand part of the “V”. Once on the big ledge, we moved the belay to below the dihedral/chimney. I used tricams to set the belay to I could have all the cams. I had a feeling that I’d need all the cams on the climb. The third pitch felt hard. It was very steep with great holds, and since my hands were way out of shape, great holds on steep terrain eventually felt like bad holds on steep terrain. At least the protection was good. Once at the top of the dihedral, the ledge looked familiar. The topo showed the route continuing up the chimney, but it didn’t look familiar to me. I yelled down to Brian and he remembered traversing right. I thought I should follow the route this time and climbed up into the chimney to see if I could make it work. The only problem was my backpack and my big body (215 lbs) fitting into that tight space. But it went. Brian wasn’t convinced that it was the real route, but if it wasn’t, it should be. Brian took the 4th pitch. He stayed on the south face, near the east edge; he climbed past one ledge and belayed on the second. The crux of his pitch was an excellent 20-foot off-width crack, where we found and cleaned a fixed nut. I took the 5th pitch, my last of the day. 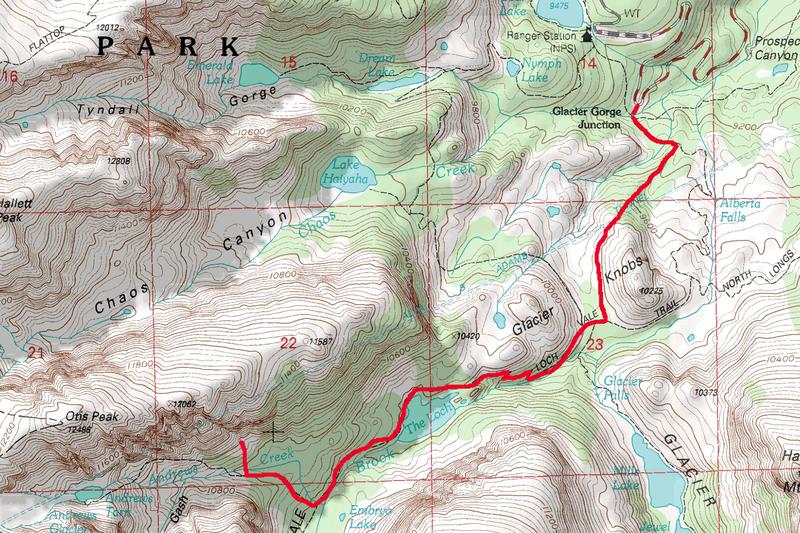 The topo said to traverse to the east side and then climb up cracks to the base of the …. But when I traversed over to the edge and looked over, it didn’t look right. As I moved back toward the belay, I noticed a fixed nut near a giant flake about 10 feet above me, on the south face. It struck me that I might be able to climb that flake and the rock above…and I could clean the nut. It was a great pitch! The climbing was awkward, but otherwise easy (5.5ish). 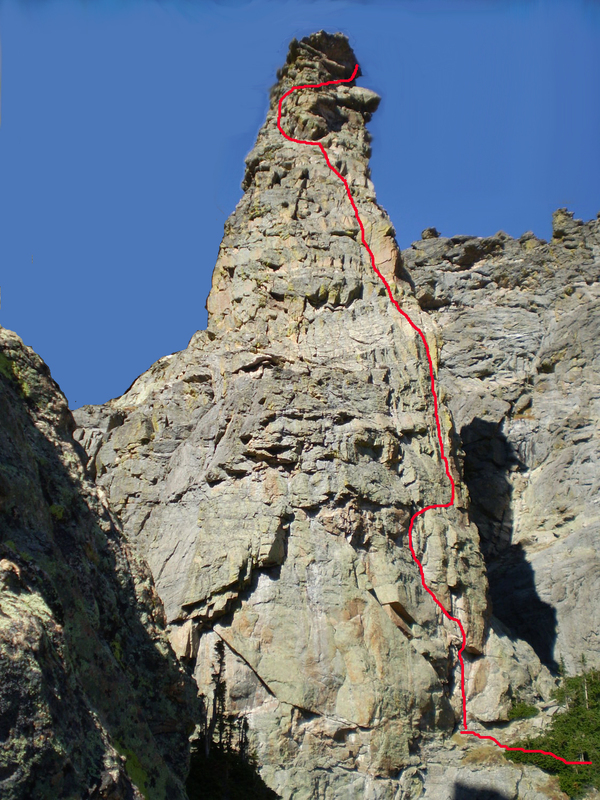 I stayed on the south face until reaching the bottom of the summit block; I climbed NE over some blocks to reach the normal belay below the crux. Still, Brian had a big job to do. He had to run the rope up to the summit, and that would take some doing for an old guy. Remarkably, he did a great job. He got all the way to the dead-vertical part, 10 feet from the top, before needing a rest. After a short rest, he made it to the top. And, then it was my turn. I started up the initial wall. It looked hard, and was certainly harder than anything climbed on the day. I made it up to the ledge below the hard crack, and then continued up past the pins and to Brian’s last piece of protection before succumbing to gravity. My hands were gone. I was surprised to feel the grip of panic as I hung from the ropes; out of practice, I suppose. I was able to put it out of my mind and just focus on helping my hands recover. But they wouldn’t come back. After a couple minutes, I decided I would just try to move up a a few feet. I did this a couple times to reach the top. My hands were so bad I was worried I couldn’t hold the rope on rappel. The weather, which had been good all day, finally turned ugly. We rappelled into the backside without incident and then scrambled down to the final rappel with only the miserly of scrambling down loose scree. We continued the scrambling down the gully to reach our packs, where we stayed to eat until a few drops of rain fell out of the sky. The light drizzle continued for about 30 minutes as we made the 1.5 hour hike back to the trailhead. We arrived at 3:30pm for an 11 hour round-trip.